Located in the heart of midtown Manhattan, directly across the street from Grand Central Station, Cipriani 42nd Street is easily accessible from all five boroughs of New York. It is a New York City Landmark, with soaring marble columns, a 65 foot ceiling, and glorious chandeliers. .Our venue will guarantee your privacy, as our ballroom only hosts one event at a time. This space is the perfect complement to the world renowned service, cuisine and reputation of the Cipriani family. Your day will begin in our beautiful and spacious bridal suite accessible whenever you need it. Without having to leave the premises, the bridal party may pamper and prepare for this special day. A Cipriani appointed personal bridal attendant will be available to assist you and we will have beverages available throughout the day. The service provided to you and your guests is beyond compare. 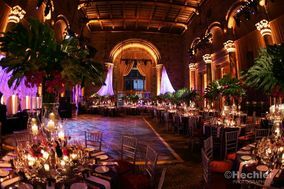 It is a Cipriani standard to provide one waiter per every five guests and one captain per every fifty guests. Our experienced Maitre de will ensure that the entire day and evening be the best of your life.